Fort Jefferson occupies most of Garden Key in Dry Tortugas National Park west of Key West, Florida. Used as a prison in the 1800s, its most famous inmate was Dr. Samuel Mudd, accused of conspiracy in the assassination of Abraham Lincoln. FORT JEFFERSON is massive. It covers almost the entire four-hectare Garden Key, the largest of the seven islets that form the Dry Tortugas in the Gulf of Mexico, 105 kilometres west of Key West. In the U.S. Civil War and for some time afterward it was a Union prison. To it in 1865 came a certain Dr. Samuel Mudd, who had been sentenced to life at hard labour for conspiring in the assassination of President Abraham Lincoln—a charge that resulted from his setting the broken leg of assassin John Wilkes Booth. The line, supposedly written on the Gates of Hell in Dante’s “Inferno,” was appropriate, for Fort Jefferson was hell on earth: rotten food, poor medical facilities, unbearable heat and humidity and with virtually no chance of escape, even if a prisoner could get across the shark-infested moat. While he was in the casement, shared with three others, Mudd at least had a view. He lost that for a time after trying to escape, which resulted in his being confined to “the dungeon” and wearing leg irons while working outside. A plaque tells part of Mudd’s story and the fort’s park rangers—the whole of the Dry Tortugas is a national park—and a video in the visitor centre fill in more of the blanks in a largely unknown part of the Lincoln assassination story. Mudd’s “life” sentence lasted just three years and seven months. He was pardoned by President Andrew Johnson for his part in fighting a yellow-fever epidemic at the fort in the fall of 1867. Mudd took charge of the prison hospital after its sole doctor died of the disease, and when he stemmed the outbreak the commander and prison officers sent a petition to Johnson asking for his release. But his name wasn’t completely cleared until the 20th century, when it was established that Mudd had known nothing of the assassination when he treated Booth. He was exonerated partly as a result of a campaign by a descendant, TV journalist Roger Mudd of CBS’s 60 Minutes . Apart from the Mudd room there’s a self-guided tour of the gun tiers, bastions, lighthouse, casements and barracks. From the 15-metre high walls there are great views of the other keys. 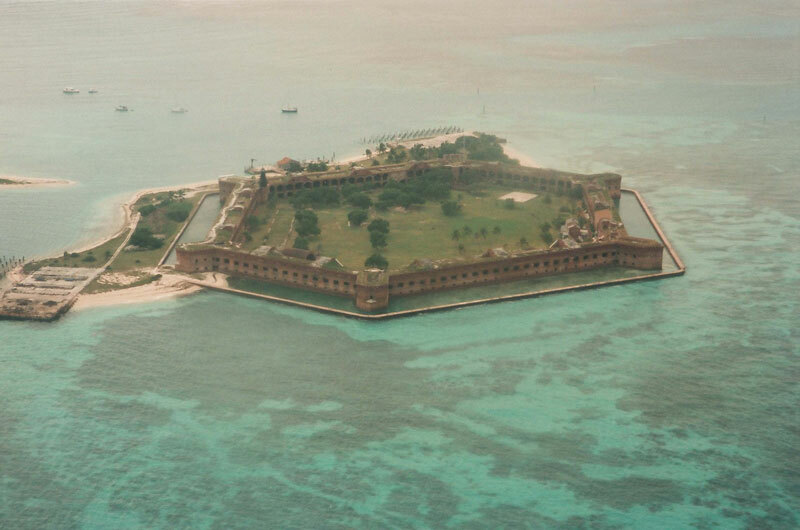 Fort Jefferson was built to control the entrance to the Gulf of Mexico, but it never heard a shot fired in anger. Ironically, it was obsolete before work stopped in 1866, for rifled cannon introduced during the Civil War (1861-65) could have reduced it to rubble. Fort Jefferson is reached by the Yankee Freedom III ferry (2.5 hours) or by seaplane (35 minutes) from Key West. Visit www.yankeefreedom.com or www.keywestseaplanecharters.com. For information on Dry Tortugas National Park check the website www.nps.gov/drto.